I took this photo at the very end of our boat trip earlier this year. We had travelled across Lake Alexandrina, along the River Murray past Goolwa to the Murray Mouth and through the Coorong. As we approached the boat ramp next to the Narrung ferry (SE of Adelaide) this lone Little Black Cormorant was waiting for my camera while deciding whether he needed to fly away from our boat, or not. 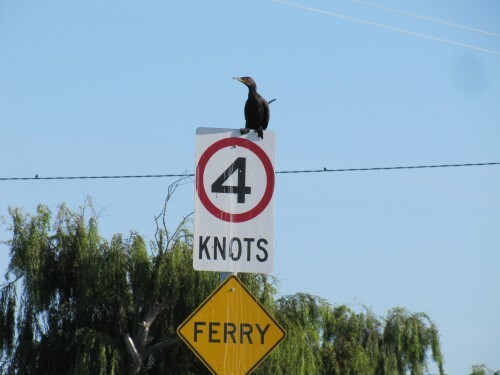 Looking at the mess on the signs, it is obvious that this is a common resting spot for many birds.